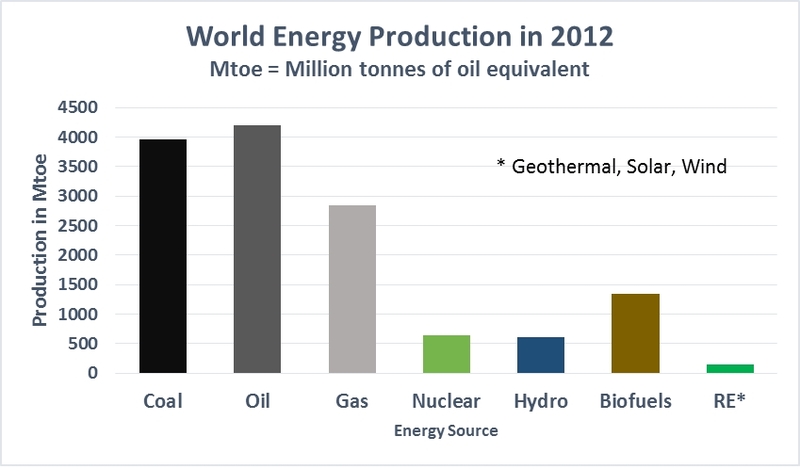 For this to come from renewable energy alone, the world would need to increase its RE energy production almost 30 fold from 143 Mtoe to 4,000 Mtoe. To replace coal with nuclear power alone, nuclear energy would need to increase sixfold from 642 Mtoe to 4,000 Mtoe. This assumes no significant changes to hydro and biofuels. In reality, coal will be replaced by a mix of both more RE and more nuclear, both being low-carbon energy sources. 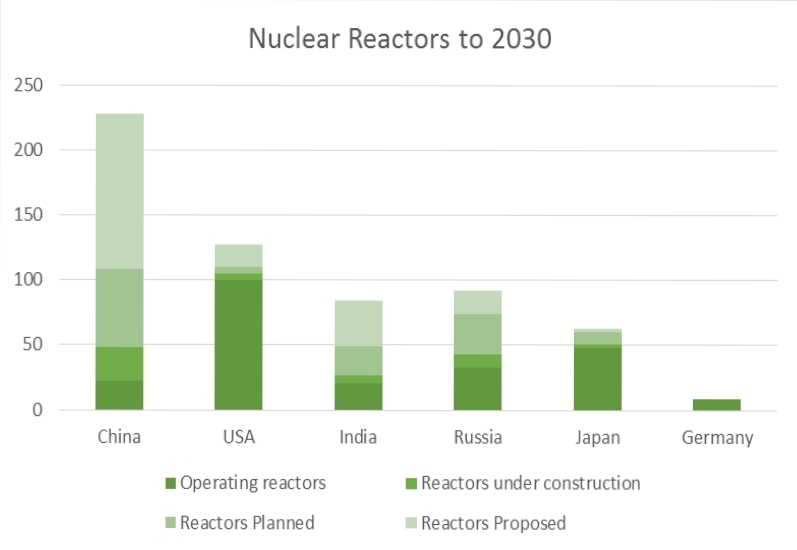 According to the World Nuclear Association (WNA), China, currently has 22 operating reactors and is well on its way to a possible tenfold increase in nuclear power with as many as 228 nuclear plants operating by 2030 with an average capacity of 1.04 GW per plant. 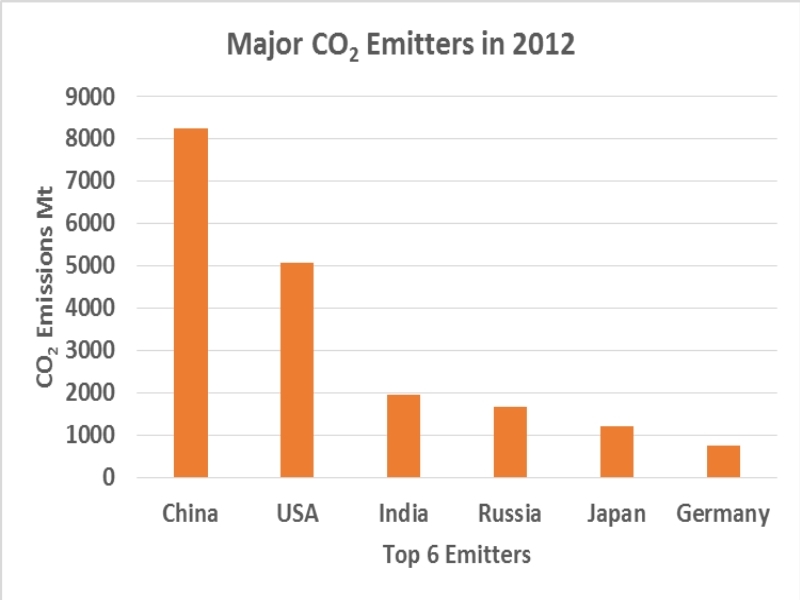 The 5 other major GHG emitting countries identified above would need to significantly increase their installed and planned nuclear base to match China. The World Nuclear Association claims there are world plans to more than double the existing fleet of nuclear plants from the current 437 operating plants to 994 by 2030. German appears to have decided to stay with its remaining 9 operating plants until 2022 with no current plans for new ones. If the world was to almost triple nuclear power capacity from 337 GW today to 983 GW by 2030, as shown in the WNA world plan, assuming all planned & proposed plants were operable by then, this would only reduce coal consumption by about half. This still leaves a gigantic challenge for other low-carbon energy sources. It is clear that we need to consider all low-carbon energy sources for the future. Nuclear power can clearly do the heavy lifting to reduce CO2 emissions and it must not be ignored or unfairly vilified. When we consider the current very small energy contribution from renewable energy sources, about 1 percent (see World Energy Production above), then the task of substantially growing that contribution 30 fold by 2030 to replace coal would be enormous. The exact mix of nuclear with renewable energy will be for individual countries to decide. China clearly sees a great advantage in using significantly more nuclear in the future to reduce its use of coal. Hopefully, the actual mix in each country would be driven more by cost and reliability than ideology and politics. Thank you for the excellent review. This message should go to decision makers to frame appropriate plan of action.We must encourage all steps however small. Thanks, Ed Leaver. If the growth of fast reactors between 2050 and 2100 were exponential, with them breeding each newcomers’ start-up fuel, it would imply a breeding ratio of 1.04. And a large reprocessing industry! That ratio is achievable, but initially slow. Extending the curve back to today would require 50 fast reactors operating now, not true, so they must be planning initial start-ups with U235 and perhaps transition eventually to Pu239 in 240. That implies at least that a large U-enrichment industry is imminent. If all fast reactor fuel initially contained enough Pu240 to ensure a minimum dilution of 7% 240/239 throughout its irradiation, it could never achieve weapons grade and would remain proliferation resistant to theft. LWR “waste” is a seriously political issue here, with dire environmental consequences. In absence of a federal waste repository, fifteen states have placed moritorium on new nuclear construction until there is one. In absence a federal waste repository, for two years the Big Green Machine successfully blocked NRC from issuing new or renewed license applications. Three guesses why we don’t have a federal waste repository. Two months ago NRC found our nuclear power industry doesn’t need one — that carefully monitored surface or near-surface dry-cask storage will suffice for the foreseeable future. Guess who’s being sued. But NRC is on firm technical ground: whether the U.S. deploys fast reactors or not, the magnitude of China’s planned FNR deployment flat guarantees a safe retirement for our used light-water nuclear fuel. The Chinese LWR program may have been calculated to supply all the plutonium needed for the 200 fast reactors of 2050. Till and Chang in “Plentiful Energy” estimated that a 1 GW fast reactor would need 5 t of fissiles. Could the LWR program accumulate 1000 t of plutonium by 2050? If a LWR generates 1 t of plutonium for every 4 t of fission, (4 GW-annum of generation) it could be accumulated across 4000 GW-annum of LWR generation. Across the next 40 years, China will probably average 100 GW of LWRs producing once-used fuel. That is, they may not need to buy US used fuel. On the other hand, the Chinese program may give rise to a “Sputnik” moment for the American public. Realising that the Chinese are getting ahead of them in the nuclear-waste-race to save the world, a future President may be able to rouse the world’s greatest technological nation with words to the effect, “we will do these things, not because they are easy, but because they are hard” (JFK, starting the race to the moon ). Is GE/Hitachi to getting any bites from anyone willing to take them up on their very bold offer? Nuclear furnaces should replace coal furnaces with all other plant continuing — Don Peterson, Alberta.